The accumulated evidence, including a new analysis specific to Maine, shows that a wage increase will not deliver these results. In a 2014 study, the nonpartisan Congressional Budget Office (CBO) tossed cold water on the argument that new mandates on low-margin employers won’t carry consequences. The CBO, which is cited as an expert by both Republicans and Democrats, estimated that a halfmillion jobs would be lost nationwide should a $10.10 minimum wage take effect. Economists at Trinity and Miami Universities replicated the CBO’s methodology and found that 770,000 jobs would be lost if legislation mandating a $12 minimum wage were enacted nationwide. The CBO based its estimates on the results of dozens of peer-reviewed academic studies on the jobs impact of a higher minimum wage, including the latest and most up-to-date research. In December 2015, the Federal Reserve Bank of San Francisco released a report summarizing that research which concluded that recent minimum wage increases have caused a reduction in 100,000 to 200,000 jobs nationally. In this analysis, Drs. 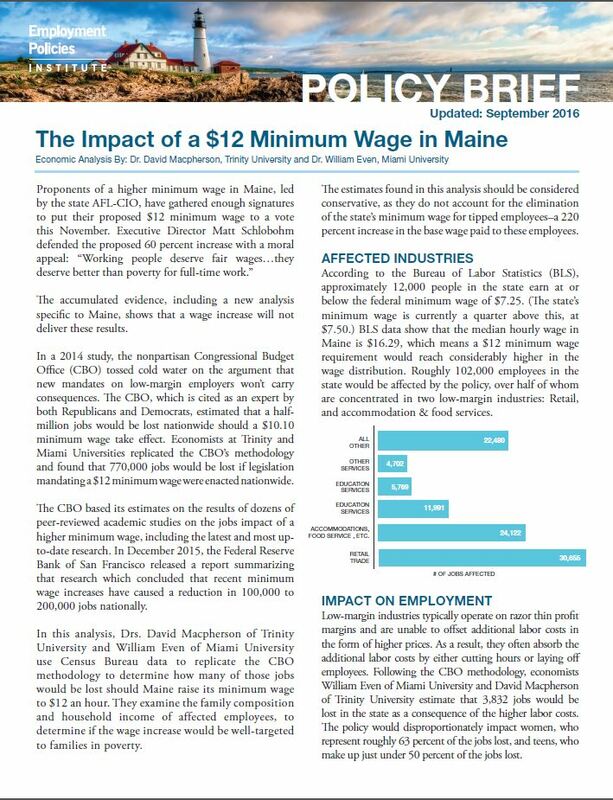 David Macpherson of Trinity University and William Even of Miami University use Census Bureau data to replicate the CBO methodology to determine how many of those jobs would be lost should Maine raise its minimum wage to $12 an hour. They examine the family composition and household income of affected employees, to determine if the wage increase would be well-targeted to families in poverty. The estimates found in this analysis should be considered conservative, as they do not account for the elimination of the state’s minimum wage for tipped employees–a 220 percent increase in the base wage paid to these employees.